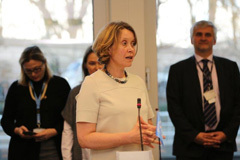 On the occasion of 8 March 2016, International Women’s Day, the BRS Secretariat and the Geneva Environment Network (GEN) launched an exhibition and awards ceremony to recognize inspirational women in Geneva working to protect the environment. The Charter of the United Nations, signed in 1945, was the first international agreement to affirm the principle of equality between women and men. Since then, the UN has played a strong part of the efforts to advance the status of women worldwide. While it is essential that gender equality is promoted and ensured through internationally-agreed strategies, standards, programmes and goals such as the SDG number 5, the greatest impact is achieved through the daily on the ground work that both men and women do. With this notion in mind, a call for nominations of inspirational women in Geneva working to protect the environment was made in February 2016. As a result, a total of 160 submissions were received all of which deserved to be recognized. 20 nominees were selected by the committee to be part of an exhibition celebrating their achievements. The majority of them originally come from Europe and Northern America, however all UN regions were represented. These 20 inspirational women represent a rich diversity of organizations, sectors, functions and nationalities. Some of these dynamic and enthusiastic women are from intergovernmental organizations: United Nations Environment Programme (UNEP), United Nations Economic Commission for Europe (UNECE), the Secretariat of the Aarhus Convention, Reducing Emissions from Deforestation and Forest Degradation (UN REDD+), United Nations Institute for Training and Research (UNITAR), International Trade Center (ITC), International Organization for Migration (IOM), World Meteorological Organization (WMO), World Health Organization (WHO), World Intellectual Property Organization (WIPO), and International Telecommunication Union (ITU). Civil society is represented by passionate and dedicated women from the Worldwide Fund for Nature (WWF International), International Institute on Sustainable Development (IISD) and the Programme for the Endorsement of Forest Certification (PEFC). Hard working, motivated women are also from the private sector, namely World Business Council for Sustainable Development and Transparency. The committee also acknowledged the important contribution of hardworking and insightful visionaries from the University of Geneva and the Swiss Parliament. As a result of its success, it is hoped that this initiative will become an annual event to celebrate dedicated, hard-working and passionate women working to protect the environment.